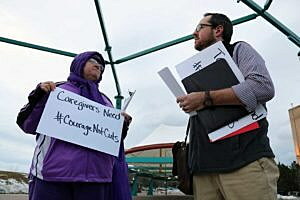 Shouting “courage, not cuts,” a group of demonstrators gathered in downtown Missoula on Thursday night to urge state legislators to reconsider proposed cuts to the budget – cuts that could have far-reaching impacts on seniors and students. 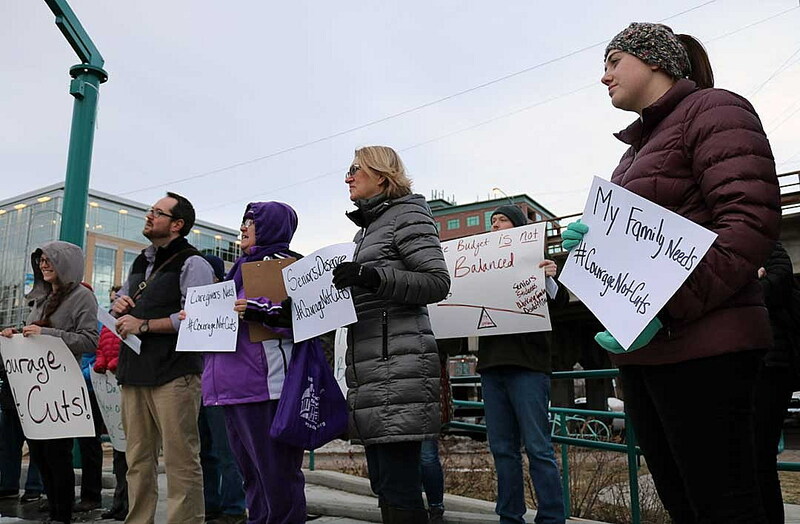 The rally was timed to coincide with the Legislature’s transmittal break, giving student and senior advocates hope that the state’s elected leaders will come together to find budgetary solutions that don’t slash funding for higher education or services relied upon by the elderly. As proposed, the Legislature looks to cut $23 million from the Montana University System and $93 million from the Department of Public Health and Human Services. The Legislature, held by a Republican majority, has already panned a proposal to raise income taxes on high-wage earners, along with a measure to raise the consumption tax on wine. Other options remain on the table, including an increase in the gas tax. On Friday, the Bozeman Daily Chronicle reported that Gov. Steve Bullock believes the Montana Board of Regents would have to consider closing a state college campus to cover the $23 million cut proposed by the Legislature for the University System. Braden Fitzgerald, the political action chair for the Associated Students at the University of Montana, said that if students had to cover the $23 million shortfall alone, it would result in a 25 percent tuition increase, or more than $1,000 per student per year. That, he said, has students worried. Mackenzie Lombardi, also an ASUM member, echoed those sentiments, saying the Legislature has done a poor job of funding public higher education over the years. If tuition is increased to cover the shortfall, she said, many students would have to drop out, as the cost of education would move beyond the reach of low- and middle-income families. The cuts to the Department of Health and Human Services also concern the state’s seniors and those charged with their care. Debbie Lester with Missoula Aging Services said the results would have devastating effects on a number of programs, from Medicaid to Alzheimer’s support and Meals on Wheels. Lester described Alzheimers as a growing epidemic that requires funding for support services and caregivers. She said more Medicaid waiver slots are needed, along with nutritional support. The cost to feed a senior through the Meals on Wheels program for a year is $200. In comparison, Lester said, the cost to house a senior in a nursing home for a month is $6,000.